Alba Serrato: My outfit is from Halloween last year I was an 80’s super model, but no one got it. My metalic striped blazer is from St. Vincent De Paul. 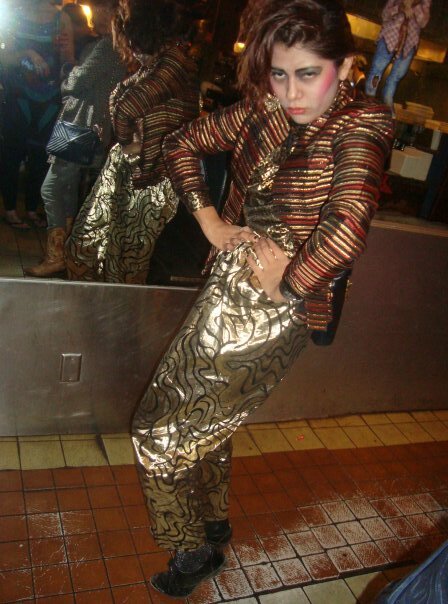 The gold pants are from my secrect thrift store in Phoenix. The patent leather oxfords are from Forever 21–clearance section. I’m poor so I gotta find those sales. My friend Tony recently gave me a copy of Mules and Men by Zora Neale Hurston. Haven’t read it yet, but it’s on my to-do list next time I have some free time to sit and read.